The Champion Juicer is powerful, durable and built to last. The new improved Champion has increased starting torque, front and rear ball bearings for smoother running and cooler operation and an optional “Greens Attachment” specifically designed for those leafy greens everyone and wheatgrass. 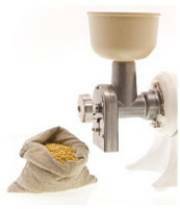 An optional “Grain Mill” is also available. 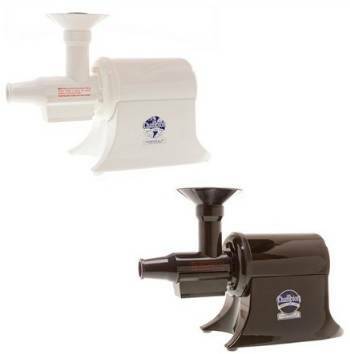 All juicer parts are made from 100 % FDA accepted nylon and stainless steel. Champion Household (or standard) Model G5-NG-853-S The Household model is powered by a 1/3 horsepower, 540 watt motor. Champion Commercial (or Heavy Duty( Model G5-PG710 The Commercial model is powered by a 1/3 horsepower, 650 watt motor. The torque is slightly higher and the motor can be converted between 110/220V, 50/60 hertz for domestic or oversea use. All parts are 100% FDA nylon and stainless steel.